Overall First Place. The winning team will get a Nintendo Switch for each team member. Overall Third Place. The winning team will get a mechanical keyboard for each team member. "State Farm is more than just an auto insurance company. It’s a provider of solutions for your life, not just your stuff. State Farm is here to help life go right." what you think may fit. Your theme can be fun, it can be applicable to real life, or whatever your team dreams up. Best finance-related solution incorporating one or more Citi Ventures focus areas. Areas include AI and ML, Distributed Ledger Technologies, Edge Computing and IoT, XR, and Next-Gen Cryptography. Each member on the winning team will get a Holy Stone HS200 FPV RC Drone. Create an app or website that helps potential home buyers pick their perfect neighborhood. There will be a first and second place team for this category. See the Fannie Mae team for more details. - Hack on any social good topic you are interested in or passionate about. Build the most innovative application using Google Assistant and the Actions on Google Platform. Points will be added for highest quality conversational experience, interesting 3rd API usage, best incorporation of GCP, and most likely to make money (viable business model). The team with best use of open source in their hack will win GitHub backpacks. Winning team will get an Amazon Echo for each team member. We want to add a UTD Alexa skill that can engage and delight our students, faculty and staff. Your challenge is to develop an Alexa skill that answers frequently asked questions by students at UTD. Use your creativity to tailor it to what you think may fit for the Comets. “Build for UTD” - The challenge is to develop an application/service/solution for UTD. Use your creativity to tailor it to what you think may fit for the Comets. The Official University Hackathon at The University of Texas at Dallas! A 24 hour event as we build apps, hardware and more at the UT Dallas campus. Whether you're a seasoned hackathon attendee or just getting started, we love to see what you can make. Directors, Organizers, Volunteers, Mentors, Sponsors, Vendors, and anyone affiliated with operations behind HackUTD are NOT eligible to submit a project. 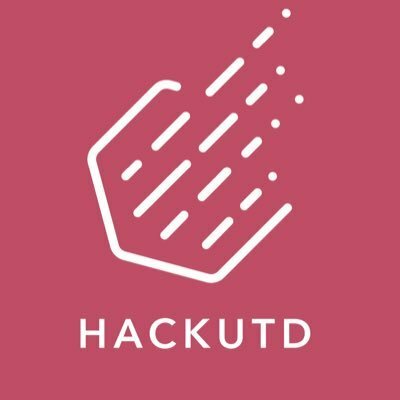 All projects must be started at HackUTD. Prior ideas are fine, but no pre-existing projects. Every Sponsor prize a hacker wants to be judged on must be tagged in the devpost submission. Does the hack work? Did you achieve everything you wanted? Did you put thought into the user experience? How well designed is the interface? For a website, this might be about how beautiful the CSS or graphics are. For a hardware project, it might be more about how good the human-computer interaction is. How technically impressive was the hack? Was the technical problem you tackled difficult? Did it use a particularly clever technique or did it use many different components? Did the technology involved make people go "Wow"?